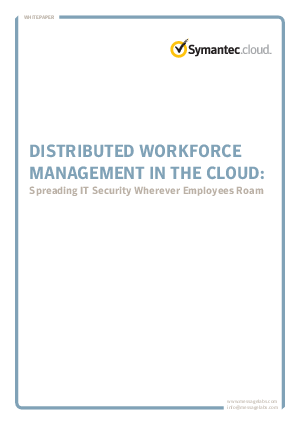 > Symantec.cloud > Distributed workforce management in the cloud: Spreading IT security wherever employees roam. The ever-increasing usage of wireless laptops and mobile devices is turning the traditional office into an un-tethered workspace that can exist just about anywhere, any time. Remote workers access data and applications that are critical to the business, often outside of the protections of the corporate network or VPN. Also, these employees are highly mobile, inadvertently exposing critical data to untrusted networks and the threat of physical data theft. All this makes it more difficult for IT to consistently enforce policies, ensure laptops and other endpoints are protected with the most current security mechanisms and malware protections, and safeguard the electronic interactions. This white paper discusses how organisations are turning to hosted or cloud-based security solutions to help manage and protect their distributed workers, while reducing capital and operating expenditures.